Robin and Rusty White’s wedding will always remain a significant addition to Rose Hill Mansion’s long and celebrated timeline. The date was April 12, 1996 and the décor was bare, yet elegant and ethereal. Stunning oriental rugs cloaked exposed subflooring. Extension cords ran like magical vines to provide the only electricity for the venue. And what walls existed formed a fragile, nostalgic shell for the antebellum home (built by Bluffton founder James Kirk in 1858) that barely survived an electrical fire in 1987. “On the morning of my wedding, when most brides are doing their hair and makeup, I was running around with a screwdriver to install doors and give the house some semblance of a façade,” Robin said. Robin continues, describing her special and momentous day. A cousin officiated the ceremony. Opera and chamber orchestra members from Atlanta filled the space with music. And she wore a family heirloom—an ivory colored silk wedding dress from the 1940s with covered buttons down the back. The visual is there. For her. For me. For you. Rustic meets sophisticated, in this “rusticated” happily-ever-after tale. And yet, imagining how special that day must have been for the Whites only does it partial justice. On April 12, 1996, the Whites celebrated more than just their union. They also raised a glass to Robin’s 30th birthday, Robin’s first year being cancer-free, and the first year of the White family owning Rose Hill Mansion. It is obvious that Robin has a profound respect for Rose Hill Mansion, its history and, most importantly, the sanctity of marriage. The Whites worked hard to renovate the house to its original state and also reconnect with the descendants of its original occupants. In fact, a Kirk relative will be married there this month, and the Whites often host the Kirks and Sturgeons (another family that owned the mansion) for special events or reunions. It is this continuously building relationship that adds to the richness of Rose Hill Mansion. Each room is like an enclave for honoring the people who have enjoyed, are currently enjoying or will enjoy the estate. Take the gentlemen’s room, for example. Relics of the past, often retrieved by the renovation process or Robin digging in the dirt, are displayed purposefully in a glass-cased, wooden coffee table. Animal trophies accent the walls and mantle. And a brown, plush leather couch is as comfortable as it is masculine. This is, no doubt, where the groomsmen convene, awaiting the nuptials of their sons, brothers and best friends. “It’s really funny and predictable; usually the men are more nervous than the women,” Robin joked. As she laughs about this, an image is evoked of men fraternizing as men do, complete with genuine sentiments veiled by masculine jokes, feet propped up on tables and crossed at the ankles. You imagine one of them realizing that he has forgotten a critical item like his socks, his cummerbund, or the wedding ring and the subsequent scramble that makes for a funny story down the line. This room is where memories are made, and it is one of many at Rose Hill Mansion. There is also the conservatory, where Rusty and Robin wed, the ladies parlor, the entrance, the dining room, the private cottage, and yes—the porch. 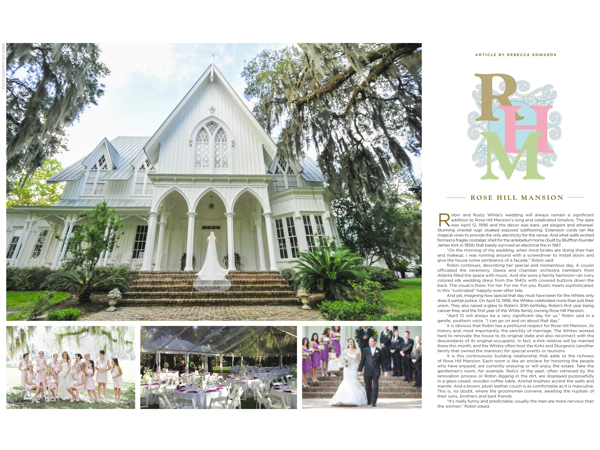 Embraced by high Gothic cathedral arches, the porch is charming and, according to Robin, where most people opt to get married—and rightfully so. The space is wrapped in romance and a time long ago but not forgotten, with 200- to 500-year-old oaks draped in Spanish moss and quietly creaking wooden floorboards. “This is a great alternative to using a church,” Robin explained. “The walkway up to the house is like a scenic aisle. The steps tier the groomsmen and bridesmaids well. And the lawn can seat several hundred people,” Robin said. In addition to the main house, which is a comprehensive, living museum, Rose Hill Mansion offers some hospitality-minded additions like the working, circa 1880 grand piano and the quaint gift shop with classic gift ideas—especially for wedding parties. 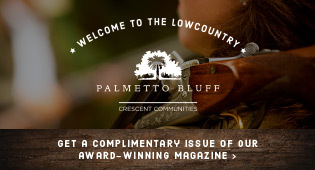 Aside from the fact that Rose Hill Mansion is the only fully restored antebellum property in the Hilton Head Island/Bluffton area, it also offers a private guest cottage for wedding preparations or a pre-honeymoon space for the newlyweds. Rose Hill Mansion’s endurance and strength for the past 155 years is a reminder to the key tenets that give marriage endurance and strength. Words like legacy, loyalty, love and faith come to mind when describing both. To learn more about Rose Hill Mansion, its history and/or event options, visit rosehillmansion.com or call (843) 757-6046.